If you're like us here at OFF THE MRKT you've been preparing your summer body all winter. Now that the weather is starting to warm up it's time to reap the rewards of all that hard work by showing it off. Sadly New York City isn't the best place to do that just yet, but a perfect place to go this time of year is Miami. With that thought we've compiled a list of destination, hotels, and restaurants you should know about if you're planning to visit the sexiest city in the sunshine state. 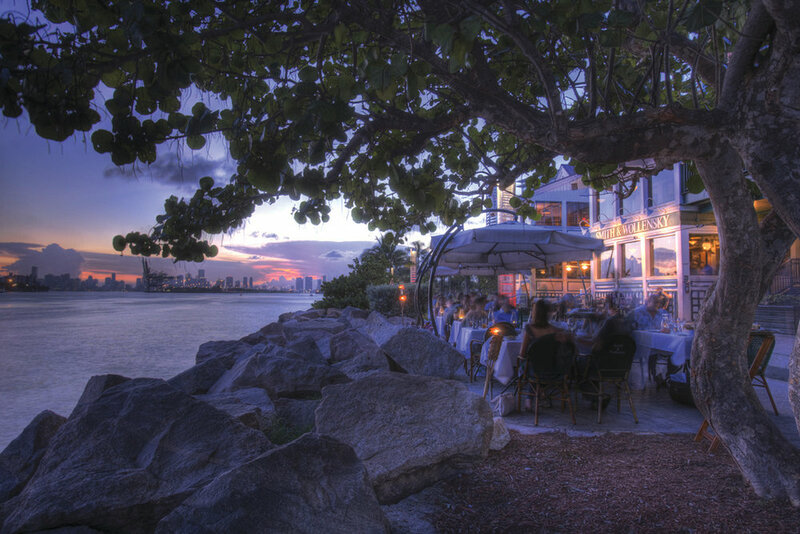 Smith & Wollensky Miami Beach Travelers looking to dine by the ocean in South Beach must take a trip to Smith & Wollensky Miami Beach. The restaurant which has been a staple of South Beach fine dining for over 20 years, has recently went through major renovations for an elevated and modernized dining experience. Some of the new additions include an overlook deck with stunning views of the oceans blue water, the best in Miami! You can watch the cruise ships leisurely sail by as you enjoy a crisp white wine, or refreshing cocktail paired with chilled shellfish including oysters on the half shell, clams, jumbo shrimps, and a wide variety of crabs. For the ultimate steak lover, Smith & Wollensky offers a decadent Snake River Farms Wagyu Sirloin that is fit for a king. Created by Executive Chef Matt King, this dish features togarashi hollandaise, pickled radishes and shiitake mushrooms, served on a Himalayan salt block. Smith & Wollensky, a first class experience, is the perfect way to start a vacation. The Gates Hotel South Beach is an excellent place to stay while in Miami, and the newly launched on-property restaurant, Agaveros Cantina, is something you don't want to miss out on. The Gates recently unveiled renovations to the lobby, bar, entrance, and destination pool deck. In addition to that the gates opened the Cantina and added fresh decor to 235-guestrooms. For your inner art lovers appreciation the hotel partners with local artist and 2018 Hassleblad aerial photography winner Jorge De La Torriente to display his work on an array of public spaces — even providing a pop-up gallery in between the third-floor meeting space. As for the Agaveros Cantina, the cooking staff is led by recent contestant of Food Network’s ‘Beat Bobby Flay,’ Executive Chef Nicolas Bour, who brings a unique twist to Mexican-inspired cuisine with dishes like crispy salt cod fritters, Mexican shrimp cocktails, grilled vegetable brochette, and more. He balances savory bites with smoky sips from the collection of more than 100 tequilas and mezcals. The fact that in a city full of authentic and refined Cuban Cuisine the Agaveros Cantina is noteworthy should speak volumes to the quality of Chef Bour's work..
Hyatt Centric of South Beach Miami Situated just 20 minutes from the Miami International Airport, Hyatt Centric South Beach is a 10-story glass tower that was built above a historic façade in the spring of 2016 which brings a modern touch to the Art Deco roots of South Beach. The 105-room hotel is the first Hyatt Centric South Beach Miami property to arrive in the area and is conveniently located in the heart of South Beach, meaning it is surrounded by a number of restaurants and shops that are within walking distance of the beach, and the famed Lincoln Road. The Hyatt Centric South Beach Miami was designed to fully immerse travelers in the Miami experience. As for guests who find them selves all wound up from going through the airport and checking into their room, you would have access to the award-winning Exhale Spa across the street, the Joe & The Juice coffee shop, and a Drybar Salon. They even has a rooftop pool and an indoor-outdoor patio lounge called DECK Sixteen which serves Spanish- Mediterranean cuisine. Faena Hotel Miami Beach: For those who are really looking to just unwind, look no further than the Faena Miami Beach. Now offering the “Suite Escape package,” you can indulge yourself with lavish accommodations at a suite, and tickets to the Museum of Ice Cream. I cannot confirm this, but I would assume that includes free samples of all the ice cream you can eat. At the Faena you won’t just make reservations; you’ll make memories, deeply relaxed memories. Sugar situated atop the 40th floor of EAST, Sugar is Miami's premier penthouse restaurant boasting a panoramic views of Brickell, while offering creative cocktails and Asian tapas. What makes Sugar really great is that if at any point in your visit to Miami you get tired of Latin inspired cuisine you can go to Sugar for a wholly different experience. Drawing upon the EAST brand’s origins in Hong Kong & China, Sugar is Asian-inspired in it's aesthetic and was designed by Los Angeles-based Studio Collective to evoke a lush, verdant Southeast Asian jungle, framed by stunning cement pillars. The Villa Casa Casuarina: Formerly the lavish home of fashion designer Gianni Versace, The Villa Casa Casuarina is an awe-inspiring open-air hotel and South Beach landmark. For fans of The Assassination of Gianni Versace: American Crime Story the Villa Casa Casuarina has the extra added benefit of allowing visitors to walk onto the set of a television show in a way that is usually reserved for Hollywood. So appreciate the majestic beauty of Versace in any of three exceptional suites, or the atmospheric Gianni’s restaurant. Take a swim in the 24k gold tile Mosaic pool, and visit Versace's spa. The Villa Casa Casuarina is the destination for tourists, romantics, and fashion lovers looking to experience a day in the life of a fashion icon. Española Way is a historic, pedestrian-only street on Miami Beach. Built as an artists’ colony in the 1920s with a creative vibe that mirrored Greenwich Village in New York and Montmartre (artists’ quarter) in Paris, Española Way was the first commercial street in Miami Beach that was modeled after the Mediterranean cities of France and Spain with large overhangs, thick stucco walls, and glazed tile-painted signs. Today the cozy Miami Beach street celebrates its rich past as a must-stop destination to shop, eat, drink, and people watch among an international crowd. The street is gently enclosed by unique, and quaint restaurants as well as lounges that are each independently owned, so you can enjoy the fact that you are supporting small businesses. Some may have become hometown institutions, including authentic Cuban food by Havana 1957, a lively trattoria by Hosteria Romana and fresh seafood by Mare Mio. Having lunch or dinner on this street is absolutely picturesque and both tourists and locals can’t help but capture the moment by taking pictures with the naturally chic backdrop. Basement at the Miami Beach EDITION: The ice-skating rink beneath The EDITION is one of Miami Beach’s best-kept secrets, so don't tell anyone about it. When you're done skating you can even un-lace your skates, and head to the hidden bowling alley to for a night of fun.